Drones have had a slow takeoff in the oilfield, despite their potential, but that could be about to change in the Williston Basin in a big way, and a Williston company is positioning itself to lead that charge. B & G Oilfield Services has recently hired a pioneer in the drone industry, from none other than Hollywood, to help the company develop a world class drone division. Joel Peterson is the man’s name, and he was among those with a booth at the recent Bakken Oil Product and Service Show held Wednesday and Thursday in Williston. Peterson has worked in both film and television for about a decade before making what he calls a “segue” into oil and gas. The sideways leap was similar to one he made when drones first came out. “I had a friend come from a show in Alaska, and he pulled out his phone and said hey, check this out,” Peterson recalls. The video his friend showed him was made by one of those early, clunky drones and it followed a dirt bike — something that’s almost cliché for a drone to do now. But at that time, this was relatively new, and Peterson couldn’t contain his excitement. He knew instantly that this was going to revolutionize everything in the film and entertainment business, and he wasted no time buying one of his own immediately. Gimbals are a series of rings at right angles used to keep a compass or chronometer horizontal in a moving aircraft. The results of these early drones required a lot of stabilization, Peterson recalled. But they were still really good stuff. So good, Peterson jumped headlong into writing an operations manual, as required by the Federal Aviation Administration, so his company could be one of the first to work with drones commercially in national air space. McLachlan gave Peterson some advice that stuck, and ultimately led him to the Bakken. In the meantime, Peterson was hired by BP to do a series of six, two- to three-minute safety videos not long after the movie “Deepwater Horizon,” which is about an oilfield catastrophe on a deepwater drilling rig. “There I saw that there was this huge side of the drone business that I had never even thought about before,” Peterson said. That potential had Peterson searching online for drone jobs in oil patches, just to see what might be out there. That’s when B & G popped up. They were looking for someone to start a drone division for them. Peterson was torn. It was a very attractive opportunity, and not just for monetary reasons. He felt he’d already learned about all he could about drones and film. This would be an opportunity to expand his drone horizons in a completely new field, and that was exciting. But did he really want to leave L.A.? Did he really want to quit the film business he’d been doing for so long? Ultimately, it was McLachlan’s off-handed advice that tilted his decision toward the Bakken. And he’s not regretting it in the least. Drones have enormous potential to help with leak prevention and safety, Peterson said. Leaks can be spotted in winter with infrared cameras that see variances in temperature. On the well pad side, “fugitive gas emissions” — or emissions on the loose when they shouldn’t be — can also be detected. Emergency response crews can use drones to take in real-time data to speed their response. 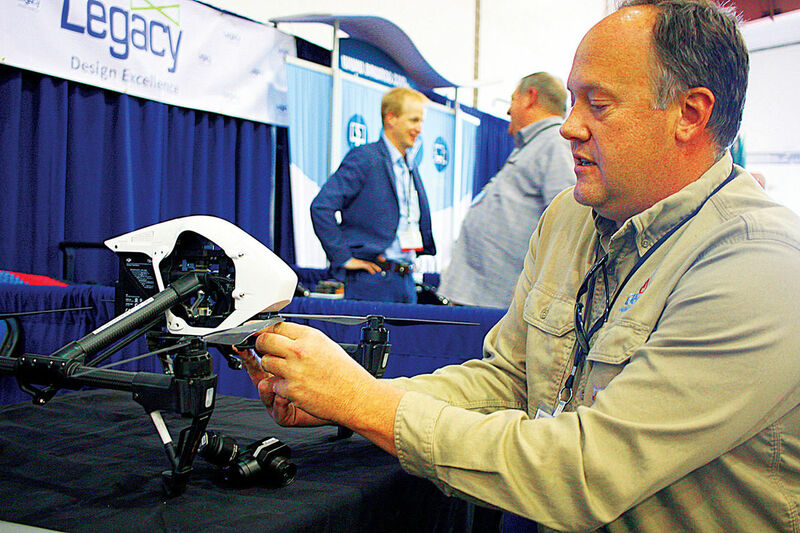 While the Bakken Oil and Product Show was a chance for Peterson to make a few contacts and get some good leads, it also allowed him to meet engineers from other companies with even more ideas for drones that he hadn’t yet considered. Among these is certification through Texas Engineering Extension, more commonly referred to as TEEX. “All the major oil companies are wanting drone companies who work for them to have that,” Peterson said. He said his company was among the first in North Dakota to earn that certification. That took four months of training, he said, and was one of the harder things he’s done. But maybe not harder than writing the drone manual, back when he started using drones commercially in the film industry, he added. Peterson hasn’t altogether given up film, by the way. He recently let his film industry contacts know that he can take work in the Wyoming, Colorado and the Dakotas. And as a result, he is already working on footage for a Chicago company that makes fungicides for wheat fields.